Stanley (pop ~600) is a historic town on the far north west coast of Tasmania. 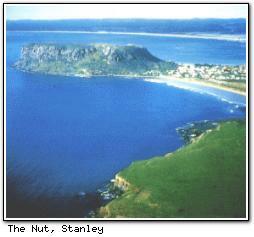 The major attraction of Stanley is The Nut, which affords a great view right along the coast. In its early days, Stanley was known for wool production and fishing; the latter is still the predominant industry. The Nut itself is 152m (500 ft) tall, and was formed when lava cooled to form basalt rock. It is possible to either climb The Nut by a walking track, or take a chairlift to the top. The Nut was known as Moo-Nut-Re-ker by the Tasmanian Aboriginals, and by 1851, sailors had come to know it simply as The Nut. Stanley's fishing fleets tie up near the old wharf, which was designed in colonial times to fend off the fierce seas which batter the cape. Although always a fishing town, crayfish and shark have replaced whales as the major catch. The town is filled with historic buildings, many over 150 years old, and including the birthplace of Joe Lyons, Australia's only Tasmanian Prime Minister. Close to Stanley is the Highfield estate, an elegant 1830's homestead including chapel, cottages and farmyard buildings, which was built for the head of the Van Diemens's Land Company. This company had been set up 10 years previously to exploit the north-west coast's wool-growing potential, but although a large farm was established, financial losses forced the company out within 30 years. South of Stanley are Mawbanna and Dip Falls. The town is about one hours drive from Wynyard, and has been named Premier Tourist Town in Tasmania more than any other town in the past decade. Good accommodation is easy to find in Stanley. The town has three 4½-star, seven 4-star and four 3½-star options (RACT rated).